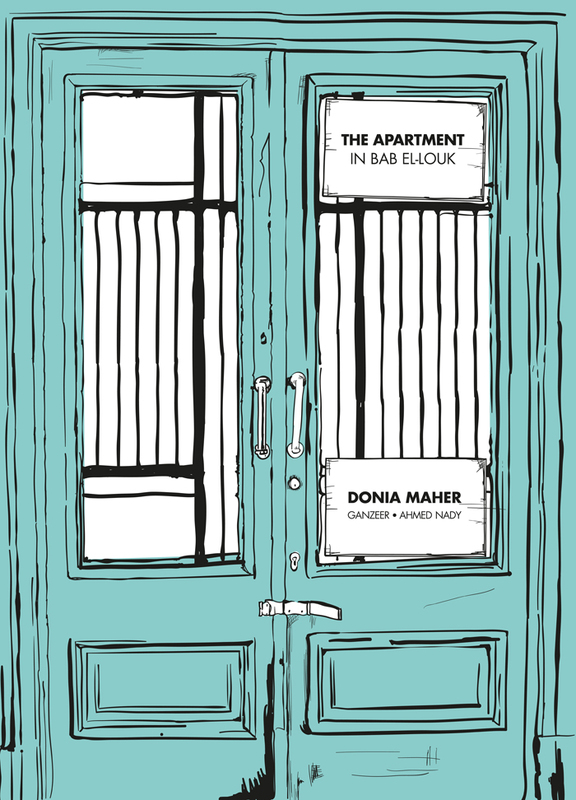 This month, Words Without Borders launched its International Graphic Novels: Volume VIIII, which features an excerpt from Donia Maher, Ganzeer, and Ahmed Nady’s “The Apartment in Bab El Louk,” trans. brilliantly by Elisabeth Jaquette. The collaborative project is a gorgeous look at life in Bab El-Louk. You can see it here. Ganzeer answered a few questions about how it came about, and what he plans to do next. AL: How did this collaboration come about? How did it “work”? Did you talk it out, or just each do your part? G: Pretty simple. Donia sent me her text, which I read and enjoyed. She did know that she wanted the visual to very much aid in the storytelling and not just be a meaningless add-on, but she did give me full control over the style and direction. I also had full control over what text would be on which page, how much text there would be, the whole thing. The very last part of her text was written in entirely in dialogue, no prose, to which she thought would be great if illustrated comic book style by the great Ahmed Nady. Upon reading it, I totally agreed that Nady would be great for that last bit, which to get him to do I had to bring him over to my place and pull a couple of all-nighters that were very much powered by delivered pizzas. AL: What’s inspired your ideas about what’s possible in a “graphic novel”? Indeed, it neither follows the rules of telling a story (with rising & falling action / character development) nor of an ordinary graphic novel (with panels, sparse text, progressive action). It’s much more like a fabulous noir poem, or a video installation… Are there particular art forms that give you inspiration? The reason for this approach is very much due to Donia’s text, which had it been published without the visuals could not be categorized as a novella, because you don’t have that kind of narration that is typical of stories. It reads more like a reflective prose of some sort. Which I feel required a similar visual language to match it, and one in which the text would very much be a part of the image. This kind of marriage of reflective text and image requires a better understanding of design more so than illustration. Luckily, I get my inspiration from all kinds of mediums. I just love visual communication in all its forms. AL: Where are you going next? Will you respond to the clamorous fans demanding you publish a graphic novel, trans. into many world languages? Previous If Feb 1 Was Robinson Crusoe Day, then Feb 2 Must Be Hayy ibn Yaqzan Day…Right? Let’s keep fingers crossed for 2015! this is very very good. like the prose and love the illos. know any good simsars? i need to move into this apt immediately! I know a guy who knows a….